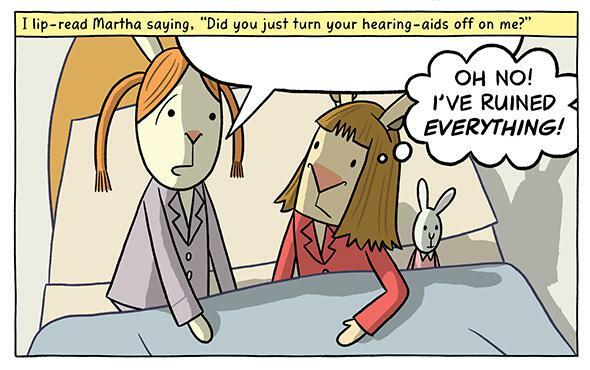 Comics memoir about deafness: Cece Bell’s El Deafo, reviewed. An all-ages cartoon memoir about a deaf girl and her search for a best friend. School librarians know this better than anyone, which is why I pay attention to their suggestions. When my kids’ librarian Amy Blaine started tweeting and telling me about Cece Bell’s memoir El Deafo, I grabbed it immediately—and I loved it. The story of Bell’s childhood after a bout with meningitis at four leaves her “severely to profoundly deaf,” El Deafo starts with a lovely, simple conceit—in a story deeply concerned with ears, all the characters are drawn as rabbits—and goes on to portray an elementary school student’s life in rich detail. Because El Deafo isn’t only the story of a deaf kid—it’s the story of a kid, who shares concerns with every young reader: school, family, and the difficulty of making new friends. It’s just that every one of those issues adds a layer of complexity when it’s done through lip-reading and sign language. I found the story funny and fascinating, and so did my 9-year-old; she related immediately to young Cece’s life while also beginning to think more deeply about the situations of people different from her. Much of the charm of El Deafo comes from Bell’s candy-colored cartooning, which makes even the story’s most difficult moments—a small child dangerously ill, a friend who turns away at a crucial moment—feel part of one, unified, optimistic story. I really love this deceptively complex comic for all ages, and I’m delighted to have Cece Bell illustrating the November issue of the Slate Book Review. El Deafo by Cece Bell. Amulet Books.